Following on from Henry and John’s piece on ‘hard Keynesianism’, here is another angle on the politics of the EU. Economic historian Kevin O’Rourke has an excellent paper setting out a very nice framework for thinking about the Eurozone. It was presented at a conference of the Institute for New Economic Thinking held recently in Bretton Woods (yes, surely a good venue for such an event). There is also a short summary here. Kevin’s creative insight is to combine the impossibility theorems from two bodies of literature – Mundell-Fleming on monetary policy, and Dani Rodrik on global governance – and to show that the Eurozone occupies an uneasy half-way house in both economic and political governance. The particular merit of setting out the issues like this is that it demonstrates why there are no optimal policy solutions, only difficult trade-offs, with different potential losers in each case. It is an innovative and stimulating exercise in political economy that deserves to gain a wide readership. Mundell and Fleming’s economic trilemma posits that you can only achieve two of three objectives in monetary policy: that is, open capital markets, domestic control over monetary policy, and fixed as opposed to floating exchange rates. ‘European Monetary Union has thus solved the economic trilemma in a particularly radical way: capital mobility combined with the complete abandonment of national monetary sovereignty’. What makes European Monetary Union such a radical solution to the political trilemma is that it not only abandons national monetary policy-making, but delegates it to a technocratic Central Bank… Moreover, this has occurred without common Eurozone policies in complementary areas, notably financial and banking regulation; and it has occurred without a move towards a common fiscal policy, which most economists also regard as a desirable complement to a common monetary policy. The most recent data from Eurostat bring out starkly the implications of the current policy mix in the Eurozone. The peripheral economies continue to be spun around by an inflexible centre, and whether they fly off in a crisis remains anyone’s guess. On the face of it, as the following graph suggests, some economies are easily diagnosed as having fiscal deficit problems. It is not hard to see how German public opinion can be persuaded that fiscal profligacy is the problem and that a dose of austerity will bring them back into line with German fiscal virtue. Italy and Belgium actually have larger accumulated debts than Portugal or Spain, but they have no immediate problems keeping their debts rolling over. Britain falls into the same cluster with its combined debt and deficit problems, but no-one is seriously worried about its policy options. The peripheral economies have problems that are different in kind, different from Germany and also from each other. ‘Fiction is a route to political truth’, says Gideon Rachman in the FT recently, noting in particular Hisham Matar’s moving novel In the Country of Men, set in Libya in the early years of Gaddafi’s rule, and The Yacoubian Building by Alaa Al Aswany, through which we may get some feeling for life in modern Cairo. Reflecting on the great Russian novels, Rachman says that literary fiction in Russia seems to have given way to crime fiction in recent times. Which makes me wonder what novels I might recommend to someone interested in gaining insight into contemporary Ireland. In Ireland as in Russia, for whatever reason, the genre of crime thriller is flourishing. Journalists and dramatists such as Gene Kerrigan and Declan Hughes set their novels in the Dublin criminal underworld. John Banville adopts an alter ego, Benjamin Black, for his detective fiction evoking an unfamiliarly noirish 1950s Ireland. The Twelve, by Stuart Neville, is about unfinished business in the aftermath of the Northern Troubles. Alan Glynn’s fast-paced thriller Winterland dramatizes the world of politically well-connected Dublin builders and businessmen at the height of the construction frenzy of the mid-2000s. But the Irish literary imagination doesn’t seem to engage very readily with grand socio-political issues or state-of-the-nation fiction. It is perhaps too soon to have a literary meditation on the calamitous economic crash. But even so, there has been relatively little serious fictional treatment of the rapid shifts in Irish society during the 1990s and 2000s. Why might this be? I posted recently on The paradoxical politics of credible commitment, noting the excellent analysis of Gordon Brown’s politics by Sebastian Dellepiane. He argues that the Labour government did not make the Bank of England independent simply in order to defuse City suspicions of them. This self-binding policy was also in fact enabling, because it made it possible for Brown to adopt a classic Keynesian economic strategy by about 2000. The Euro started out as a self-binding credibility-gaining mechanism for Eurozone member states. But the Euro also turned to have an ‘enabling’ side to it. It contributed to new kinds of instability by facilitating the extension of cheap credit and by permitting increasingly risky lending practices to spread throughout the European financial system, in Germany and France as well as in the weaker peripheral economies. This has led me to think some more about the relevance of the logic of credibility gains in the current European crisis. The self-binding austerity politics now under way in the Eurozone also has some paradoxical features. The crisis has produced an explosion of fiscal deficits and an accumulation of sovereign debt. The ECB favours fiscal austerity to restore stability, and so does German public opinion. This means that every other member state must adjust to low demand conditions and domestic deflation. But while Gordon Brown’s self-binding monetary policy proved to be enabling, Eurozone governments’ self-binding fiscal policy might be seen as self-disabling, because it involves commitment to a strategy that may prove self-defeating. There are two reasons for this. Some observers have wondered why Ireland’s dramatic economic crash has not produced more visible anger. Where are the street riots, they ask. The Greeks, they say, do this sort of thing better, the Icelanders managed to rise up as one – what is wrong with us? The Irish banks are a vast financial black hole and taxpayers are looking at crushing liabilities stretching into the future. Unemployment is over 13%. For those in work, pay packets have shrunk yet again as new taxes and charges kick in. Many households carry huge debt. Emigration is making a return. The terms of the EU-IMF loan constrain the terms of economic debate: we are not a sovereign economic state. Yet everyday life looks like business as usual. The election campaign is slightly surreal for this reason. Last night saw a US-style TV discussion involving the five main party leaders, all men and all wearing identikit business suits. The studio audience, picked by a PR company to represent undecided voters, was pained yet polite. But these are surface impressions. Out there, as the parties well know, all the evidence indicates that the voters are merely biding their time, ‘waiting in the long grass’. This could be a realigning election, a shape-shifter for the Irish political system. We won’t know for some time yet whether we are living through a game-changing period in which a dominant economic paradigm is replaced by something else. We don’t yet know what the catchy label will be for it. Yet some of our conventional notions about how states manage market expectations have already been upended in recent times. One of these concerns the politics of credible commitment, which doesn’t always work the way we think it should. Ireland’s Budget: living under Draco? Budget 2011 which is before the Irish parliament now is widely described as draconian. This is the first instalment in the four-year plan to bring the budget deficit to below 3% by 2014. 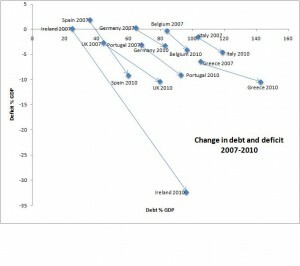 The adjustment is front-loaded to take out €6bn in spending cuts and tax increases in 2011. The total retrenchment will come to €15bn, under the terms of the recent IMF-ECB rescue plan. The scale of the effort required is massive. The reason is not because the government deficit is so high – by itself, this would be painful but manageable – but because, as part of the loan agreement, no renegotiation of bank debts is possible. The large private deficits in the financial sector have been, in effect, socialized. There is no real distinction any more between the sovereign debt and bank debt. As a result, the government deficit this year stands at 32% of GDP. Ireland thus becomes an international showcase for a new kind of politics. What happens to a country swallowing the political poison of internal deflation, and trying to grow its way out of trouble when it can neither gain competitive advantage by devaluing, nor inflate away the distributive conflicts that must ensue? Suppose the interest rate payable on its large loan is 5.7%, growth estimates of 2% are deemed too ambitious, and the immediate consequence of the stabilization plan is to be awarded a downgrade by the international bond ratings agencies? Note that national per capita income is already 20% lower in 2010 than it was in 2007. Add in the facts that the ruling coalition is deeply unpopular, the smaller party has declared its plan to withdraw soon, and the slim government majority relies on the votes of two often fractious independent deputies. How might this grim scenario unfold? Ireland’s recent €85bn bail-out package negotiated with the IMF and the EU is discussed in terms that verge on the apocalyptic. The rescue was supposed to serve as a break against the wildfire of market bondholder panic. And yet the upward trend in Portuguese bond rates has scarcely been slowed. Beyond Portugal is the much larger Spanish economy. Portugal, like Greece and Ireland, could probably just about be rescued within the terms of the current emergency scheme. It is becoming increasingly possible that the bond markets may make it too difficult for the Spanish government to refinance its loans and to raise new money on government bonds. If this were to happen, the European Financial Stability Fund would come under extreme pressure. And worse, if it is not possible to restore confidence in the stability of the Euro, there seems little reason why other countries may not also be in trouble. Spain is now where the line in the sand must be drawn. But we have heard this before. If Spain is vulnerable, why not Italy; and if Italy, why not Belgium, perhaps even France. Little wonder that the imagery of contagion, of financial plague, is brought into play.